For my money, Cackle & Oink on Texoma Parkway in Sherman is the best sit-down BBQ place in the area. My opinion is that for BBQ at its best you can’t beat a top notch stand, joint, or shack. 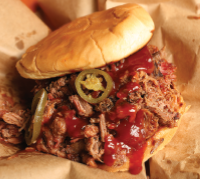 But when it comes to a comfortable place to sit and enjoy a plate of ribs or pulled pork, Cackle & Oink is the place. The filets are breaded rather than battered, and the result is catfish that is flaky inside and out. A full order is four pieces so there is no going away hungry, and the filets are sweet and pure white. If you like your catfish crunchier and drier, tell ‘em to “burn it.” The tartar sauce and cocktail sauce that are made in Huck’s kitchen are as fresh as the hush puppies and coleslaw, and you can’t have catfish without hush puppies and coleslaw. It’s probably a law or something. 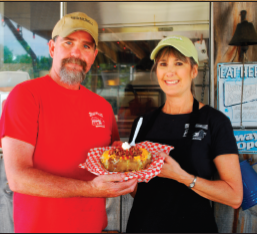 While you can order a brisket or pulled pork sandwich or a barbecue plate, what sets Denison’s Old Mining Camp apart are the innovative things Darrell and Rebecca Harris come up with to utilize their smoked meats. Nick Williams at Williams Old Style BBQ in Colbert, Oklahoma is the hands down choice for the POSam Memorial Brown Gravy Sauce Award for the second year running. His smoker is hitched behind his truck, and he takes it home every evening when he closes up his stand just east of the Interstate. The work space in the stand he had built and then mounted on a homemade trailer is tight—submarine galley tight. “It so small, I just about reached the point where I can’t add anything else to the menu,” he said. He prepares an order when it’s ordered and not before. 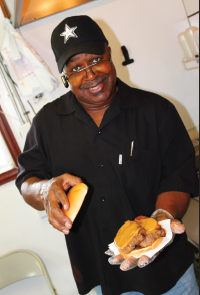 “I make real food, not fast food,” he tells customers who get impatient. We would be remiss if we didn’t mention Edd’s potato salad. It’s way more than just good. “I can’t take credit for that,” Fleming said. “My mom makes the potato salad, and I’m not quite sure everything she puts in it.” Oh well, even the closest of families have a few secrets. In Texoma recently, a baker’s dozen of serious barbecue students spent a Saturday afternoon looking for something good to eat. What follows are the notes from the road, a consolidation of their opinions, as they went looking for barbecue, looking for meat, and finding Texoma’s Favorite BBQ Joints, Shacks & Stands. Rick’s Chophouse is exactly the kind of dark mahogony, burgundy leather booth appointed restaurant that promises substantial cocktails, well tempered appetizers; cold, fresh salads; big, thick, tender steaks, and a conservative selection of sensible sides. The place delivered exactly as expected. Some folks say that you can tell a lot about a man by his shoes. If true, Naif Risk’s shoes, sturdy, dependable and well maintained, declare him an amiable man with a can-do attitude. His father’s shoes would say the same, as would have his grandfather’s. All three generations of Risk men have shaped the success of one of Sherman’s oldest businesses with their skill and congeniality. William (Bill) McCutchen III has been this close to New Kids On the Block (NKOTB). The West Hollywood, California Emmy-nominated film and television producer produced the 1998 indie film Southie, that starred former teen idol, Donnie Wahlberg. Wahlberg was part of the original boy band NKOTB. Why are we telling you this? Glad you asked. McCutchen is the owner of Texoma’s newest radio station. In the time before the freeways, automobile travelers entered Sherman and Denison on city streets lined with tall trees and stately houses. Our city centers were marked by civic buildings, town squares, and church spires rising up out of park-like groves. This rich architectural heritage, coupled with our location among the rolling hills of the Cross Timbers, created a unique identity for the two towns.